Verilog gate level expected questions. a. Since scan and other test structures are added during and after synthesis, they are not checked by the rtl simulations and therefore need to be verified by gate level simulation. b. Static timing analysis tools do not check asynchronous interfaces, so gate level simulation is required to look at the timing of these interfaces. c. Careless wildcards in the static timing constraints set false path or mutlicycle path constraints where they don't belong. d. Design changes, typos, or misunderstanding of the design can lead to incorrect false paths or multicycle paths in the static timing constraints. e. Using create_clock instead of create_generated_clock leads to incorrect static timing between clock domains. f. Gate level simulation can be used to collect switching factor data for power estimation. g. X's in RTL simulation can be optimistic or pessimistic. The best way to verify that the design does not have any unintended dependence on initial conditions is to run gate level simulation. f. It's a nice "warm fuzzy" that the design has been implemented correctly. If we have verified the Synthesized netlist functionality is correct when compared to RTL and when we compare the Synthesized netlist versus Post route netlist logical Equivalence then I think we may not require GLS after P & R. But how do we ensure on Timing . To my knowledge Formal Verification Logical Equivalence Check does not perform Timing checks and dont ensure that the design will work on the operating frequency , so still I would go for GLS after post route database. OR Gate output will be 1. RNMOS is resistive nmos that is in simulation strength will decrease by one unit , please refer to below Diagram. 4) Tell something about modeling delays in verilog? When specifiying the delays it is not necessary to have all of the delay values specified. However, certain rules are followed. When only 1 delay is specified, the value is used to represent all of the delay types, i.e. in this example, t_rise = t_fall = t_off = 3. When two delays are specified, the first value represents the rise time, the second value represents the fall time. Turn off time is presumed to be 0. When three delays are specified, the first value represents t_rise, the second value represents t_fall and the last value the turn off time. 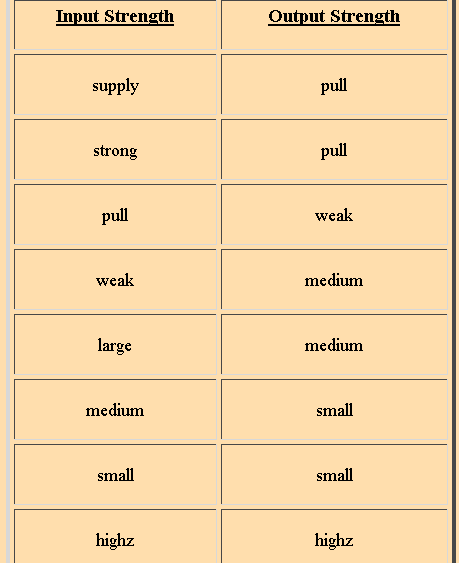 Similar rules apply for th especifying order as above. If only one t_rise value is specified then this value is applied to min, typ and max. If specifying more than one number, then all 3 MUST be scpecified. It is incorrect to specify two values as the compiler does not know which of the parameters the value represents. This shows all values necessary for rise and fall times and gives values for min, typ and max for both delay types. Here, 5 represents min, typ and max for the fall time. N.B. T_off is only applicable to tri-state logic devices, it does not apply to primitive logic gates because they cannot be turned off. 5) With a specify block how to defining pin-to-pin delays for the module ? 6) What are conditional path delays? Conditional path delays, sometimes called state dependent path delays, are used to model delays which are dependent on the values of the signals in the circuit. This type of delay is expressed with an if conditional statement. The operands can be scalar or vector module input or inout ports, locally defined registers or nets, compile time constants (constant numbers or specify block parameters), or any bit-select or part-select of these. The conditional statement can contain any bitwise, logical, concatenation, conditional, or reduction operator. The else construct cannot be used. 6) Tell something about Rise, fall, and turn-off delays? Timing delays between pins can be expressed in greater detail by specifying rise, fall, and turn-off delay values. One, two, three, six, or twelve delay values can be specified for any path. The order in which the delay values are specified must be strictly followed. // rise is used for 0-1, and z-1, fall for 1-0, and z-0, and turn-off for 0-z, and 1-z. 7)Tell me about In verilog delay modeling? Distributed delay is delay assigned to each gate in a module. An example circuit is shown below. 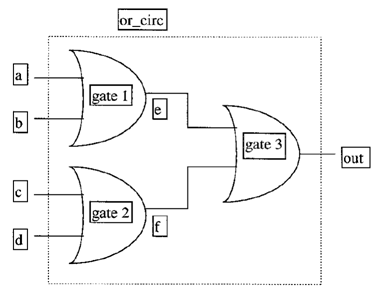 When the input of any gate change, the output of the gate changes after the delay value specified. A delay of 4 is assigned to the or-gate. This means that the output of the gate, e, is delayed by 4 from the inputs a and b. The above or_circ modules results in delays of (4+3) = 7 and (6+3) = 9 for the 4 connections part from the input to the output of the circuit. Lumped delay is delay assigned as a single delay in each module, mostly to the output gate of the module. The cumulative delay of all paths is lumped at one location. The figure below is an example of lumped delay. This figure is similar as the figure of the distributed delay, but with the sum delay of the longest path assigned to the output gate: (delay of gate 2 + delay of gate 3) = 9. As can be seen from Figure 2, gate 3 has got a delay of 9. 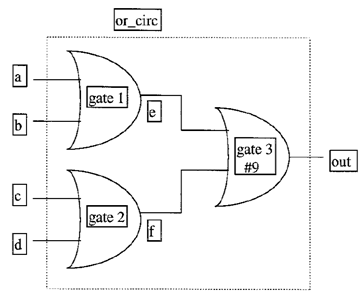 When the input of this gate changes, the output of the gate changes after the delay value specified. This model can be used if delay between different inputs is not required. Pin - to - Pin delay, also called path delay, is delay assigned to paths from each input to each output. An example circuit is shown below. The total delay from each input to each output is given. The same example circuit as for the distributed and lumped delay model is used. This means that the sum delay from each input to each output is the same. Path delays of a module are specified incide a specify block, as seen from the example above. An example of delay from the input, a, to the output, out, is written as (a => out) = delay, where delay sets the delay between the two ports. The gate calculations are done after the path delays are defined. For larger circuits, the pin - to - pin delay can be easier to model than distributed delay. This is because the designer writing delay models, needs to know only the input / output pins of the module, rather than the internals of the module. The path delays for digital circuits can be found through different simulation programs, for instance SPICE. Pin - to - Pin delays for standard parts can be found from data books. By using the path delay model, the program speed will increase. 8) Tell something about delay modeling timing checks? This section, the final part of the delay modeling chapter, discusses some of the various system tasks that exist for the purposes of timing checks. Verilog contains many timing-check system tasks, but only the three most common tasks are discussed here: $setup, $hold and $width. 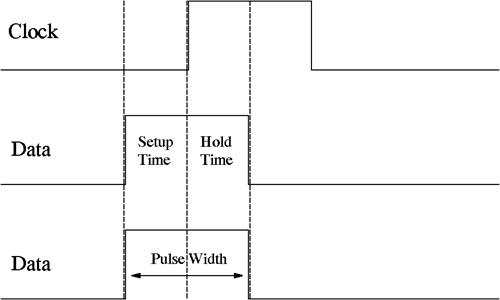 Timing checks are used to verify that timing constraints are upheld, and are especially important in the simulation of high-speed sequential circuits such as microprocessors. All timing checks must be contained within specify blocks as shown in the example below. The $setup and $hold tasks are used to monitor the setup and hold constraints during the simulation of a sequential circuit element. In the example, the setup time is the minimum allowed time between a change in the input d and a positive clock edge. Similarly, the hold time is the minimum allowed time between a positive clock edge and a change in the input d.
The $width task is used to check the minimum width of a positive or negative-going pulse. In the example, this is the time between a negative transition and the transition back to 1. NB: data_change, reference and reference1 must be declared wires. time_limit: minimum time required between the two events. Violation if: Treference - Tdata_change < time_limit. time_limit: minimum time required between transition1 and transition2. 9) Draw a 2:1 mux using switches and verilog code for it? This circuit assigns the output out to either inputs in1 or in2 depending on the low or high values of ctrl respectively. An inverter is required in the multiplexer circuit, which is instantiated from the previously defined module. 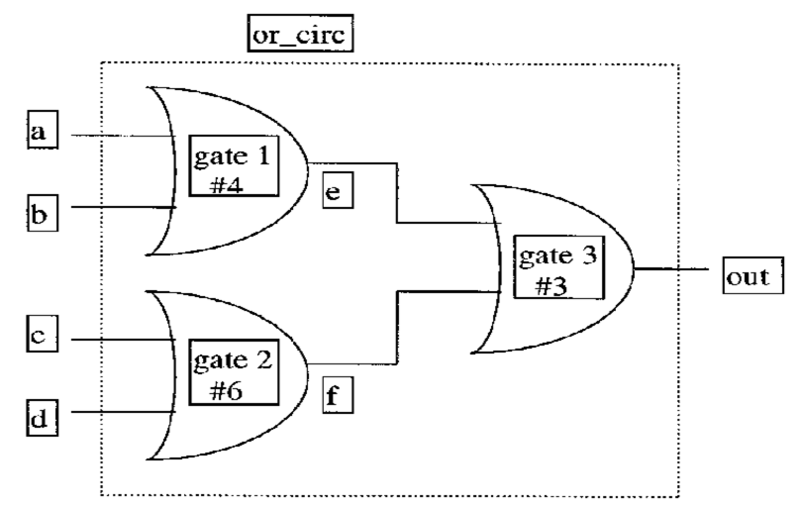 Two transmission gates, of instance names C1 and C2, are implemented with the cmos statement, in the format cmos [instancename]([output],[input],[nmosgate],[pmosgate]). Again, the instance name is optional. The above table gives all the gate level constructs of only the constructs in first two columns are synthesizable.